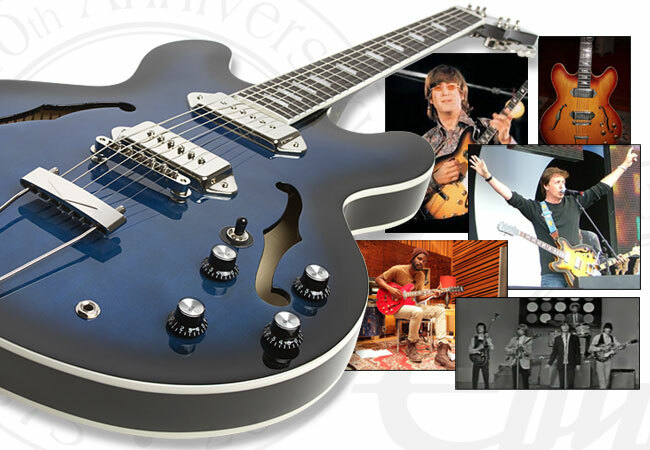 The Epiphone Casino might be the House of Stathopoulo's most iconic instrument thanks to its association with The Beatles. 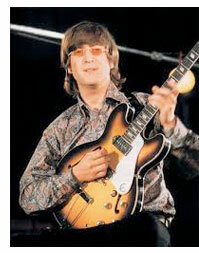 In fact, two Kalamazoo designed guitars--the J-160E acoustic/electric (check out the classic Epiphone John Lennon EJ-160E) and the Epiphone Casino--together share the distinction of being the only two guitars heard on every Beatles recording session. 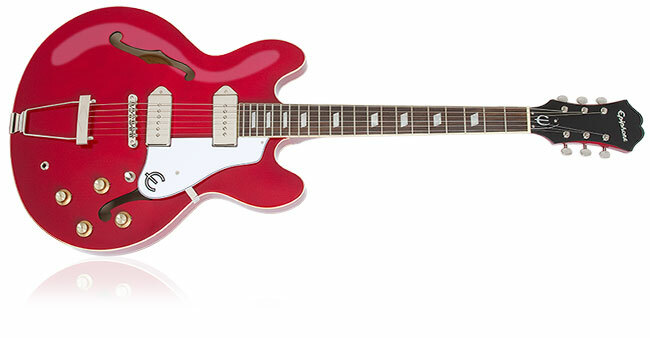 But over the last decade thanks to a diverse group of artists like Gary Clark Jr., Radiohead, Paul Weller, and Brendan Benson of the Raconteurs, the Epiphone Casino has transcended its Beatle connection and become a must-have for any player's collection. Though the Casino, first released in 1961, was essentially Epiphone's version of the Gibson ES-330, the Gibson version never caught on like the Casino. 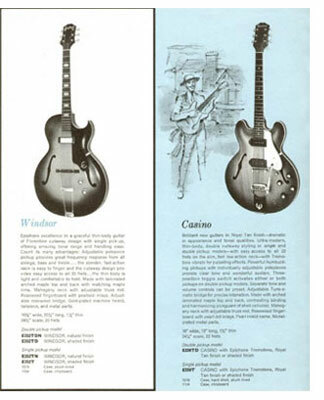 Whether it was the times or the number of instruments produced, the Casino--a full hollowbody with two P-90s (another Kalamazoo invention)--was destined to be thought of as an Epiphone classic. And like any great guitar--by design or by accident--it's perfect just the way it is. Today, Epiphone makes Casinos just as they did at the Kalamazoo factory in 60s. 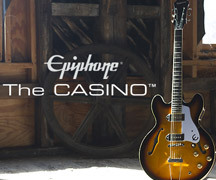 "Our modern Casino is based on the best vintage models we could find," said Epiphone President Jim Rosenberg. "The only difference is that today, every Casino is consistently great--perfect neck, great sound, and great look, where as vintage models can be vary quite a bit." And if you want to really step back in time, check out the 2014 Elitist Ltd. Ed. "1965" Casino Outfit which more than rivals any vintage models. 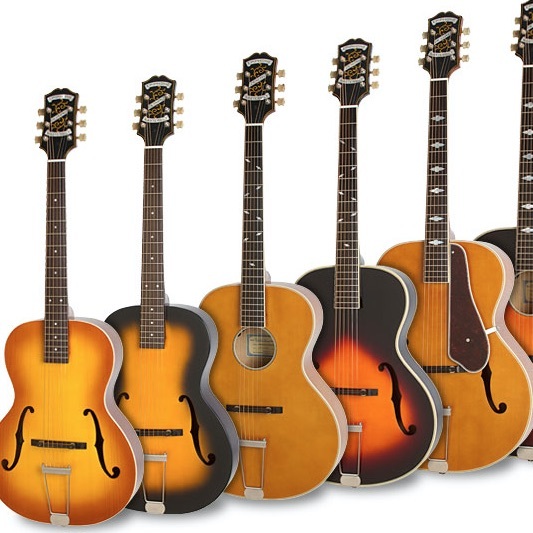 Epiphone Elitist acoustic and electric guitars are made at our Epiphone factory in Japan that specializes in handmade, highly accurate reissues made with time honored methods and impeccable attention to vintage detail and quality, including period-correct USA pickups and electronics. 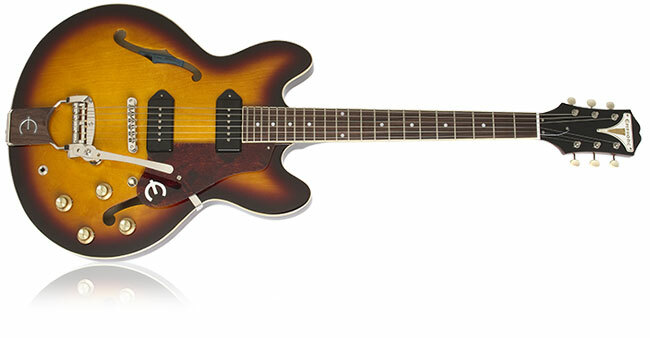 Epiphone Elitist instruments also feature traditional hand rubbed nitrocellulose color finishes that enhances a guitar’s look over time with gradual shading and fading patterns that are as unique and personal as your own story. Today, Epiphone’s Elitist Series instruments are some of the most sought after by players of all styles, and the Elitist factory in Japan is considered one of the premier instrument factories in the world. In 1961, the Epiphone & Gibson factor in Kalamazoo, Michigan was one of the premier instrument factories in the world and the Casino was merely another instrument in a series of "Thinline" electrics first introduced in the late 50s that helped announce a new era for Epiphone after it became part of Gibson brands. The idea of a Thinline electric that had the look of an archtop was not that much of a departure for Epiphone since the company had established a stellar reputation (much to the annoyance of Gibson) as an excellent archtop builder. 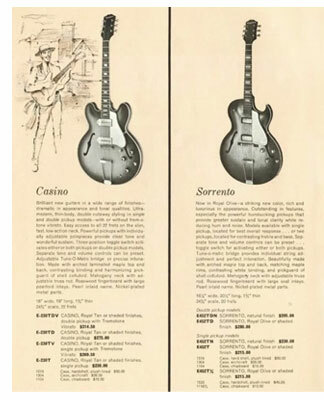 But where as most of the original Thinline series like the Sheraton and the 335 featured a mahogany center block on which the pickups were mounted the Casino held the distinction of being a true hollowbody. It was also less expensive than other Gibson Thinline models, which caught the attention of young rockers like Garry Tallent, future bassist of the E Street Band. "Epiphones were great guitars back then and affordable," recalled Tallent. "Even today, whenever I go to a guitar show, if I see an Epiphone electric or acoustic that's in great shape, I get it. They always sound perfect." 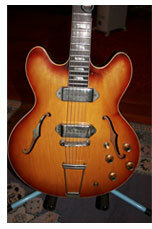 As for just who originated the Thinline series, that remains somewhat of a mystery. "There were other companies at the time like National who were making something similar," said Walter Carter who published The Epiphone Guitar Book, a history of Epipohne, in 2013. "If it were Ted McCarty's idea he certainly would have taken credit for it (laughs). But the Casino's popularity in particular had mostly to do with The Beatles. It was and is a great guitar for rock and roll with a different sound." Epiphone re-created the original (1961) Casino in 2011 with the same 16" wide body made of 5-layer Maple/Birch and a 24-3/4" scale mahogany SlimTaper™ neck with a Rosewood fingerboard attached using the traditional mortise and tenon neck joint. The 50th anniversary Casino also featured black Gibson USA P-90 pickups and a slightly modified Tremotone tremolo that works much better than the original. Epiphone's 50th Anniversary Casino (a favorite touring guitar for Gary Clark Jr.) also featured 16 frets clear of the body and came in a Sunburst or Royal Tan finish. Over the next few years, there were small changes made to the Casino. Epiphone moved away from the "bullet" logo in 1962 to the pearloid-inlaid Epiphone script logo that remains today. During the time that Paul McCartney purchased his Casino in 1964 and John Lennon and George Harrison purchased their Casinos before the Revolver tour in 1966, fingerboard inlays changed from dot to parallelogram inlays and the tortoise shell pickguard changed to white. Pickup covers, which were nickel from 1963-1964, changed to chrome. The Beatles discovery of the Casino came just before Christmas in 1964. McCartney told Vintage Guitar that he was inspired to buy a guitar that could "feedback" after he spent an evening at John Mayhall's house listening to records. "You'd go back to his place and he'd sit you down, give you a drink, and say, 'Just check this out,'" said McCartney. "He'd go over to his [tape] deck, and for hours blast you with B.B. King, Eric Clapton... he was sort of showing me where all of Eric's stuff was from. He gave me a little evening's education. I was turned on after that, and [bought] an Epiphone." John Mayall probably played McCartney cuts by B.B. King as well as razor sharp 45s on Cobra Records by Magic Sam and Otis Rush, both regular Epiphone players. "I showed him (McCartney) my hollowbody guitar that I'd bought when I was in the army in Japan in 1955," Mayall told Vintage Guitar. "When people get together and listen to records, they talk about all kinds of things related to the music, so obviously we must have touched upon the instruments and it struck home. He got a hollowbody after to get that tone." Recording feedback was already a part of The Beatles sound at this point with the release of "I Feel Fine," which was recorded in October 1964 and was inspired by John's 160E feeding back against an amp. The Epiphone could feedback too, but thanks to smaller body size, a guitarist could more easily control the tone and "howl" of the feedback by turning the Casino away from an amp or "playing" the feedback with the guitar's volume and tone controls. McCartney still brings out his original 1963 Epiphone (shipped from Kalamazoo, Michigan on November 1, 1963) in concert for "Paperback Writer" and select cuts from Sgt. Pepper. Radiohead Producer Nigel Godrich, whose pal Thom Yorke plays a 1965 Casino, singled out McCartney's Casino as his favorite guitar while producing Chaos and Creation In the Backyard. "If I had to choose one electric guitar," said McCartney, "it would be this." McCartney's Casino or ES-230TD, featured an early Gibson-style headstock that would be changed to the classic Epiphone "hourglass" headstock by the time George and John bought their Casino's (George's, like Paul's, featured a Bigsby tremolo). Most Casinos made from the mid '60s to the end of the decade were Sunburst though Cherry was also an optional finish after 1967. Critically acclaimed Nashville pop artist Tristen plays one of those rare Cherry Casinos (a '67) in concert. There are also a few rare custom colored Casinos that show up from time to time, including one in Silver Fox that is Brian Ray's favorite guitar. "It's black with "TV" yellow grain showing finish. A kind of translucent black. 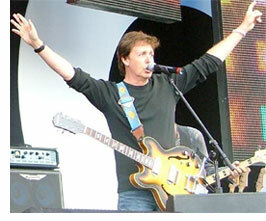 I've never seen another one like it," Ray told Epiphone. "I dare you to find one like it. You'll find a Rivera but you won't find a Casino. They're so rare. 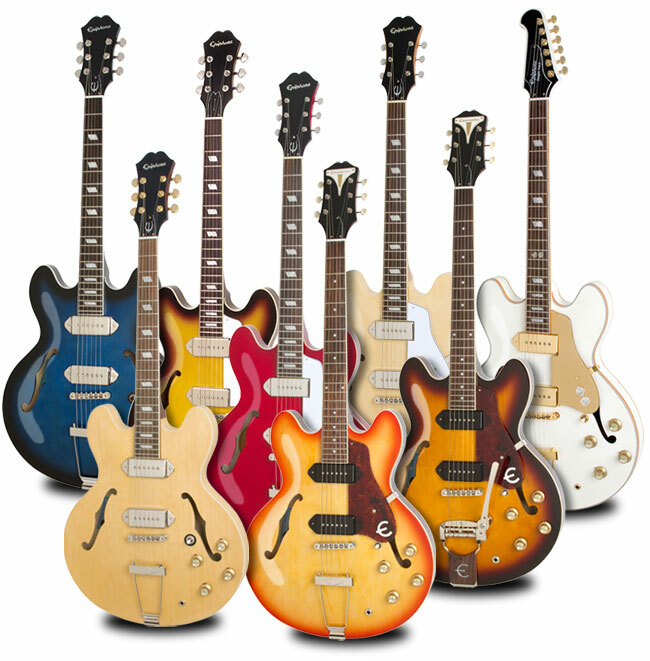 People need to know the whole history of Epiphone. It didn't just start with The Beatles. Epiphone is awesome and the world needs to know about it." In the heyday of the British Invasion, the Casino was also Rolling Stone Keith Richards' main guitar (who used his to record "Satisfaction") and Brian Jones can be seen playing one on the cover of the reissue EP of Got Live If You Want It. There are also tv clips of The Hollies, The Kinks, and the Moody Blues using their Casinos on shows like Ready, Steady, Go! The Casino was discontinued throughout the 70s and when Epiphone got back into action in the 90s, both vintage and new Casinos enjoyed a renaissance thanks to Paul Weller (whose 1964 Casino is seen at right), Lenny Kravitz, Noel Gallagher of Oasis, U2's the Edge, Jeff Tweedy of Wilco, Brendan Benson of the Raconteurs, instrumentalist William Tyler, and of course, Dwight Yoakam who has carried the flag for the Casino for years before designing his Dwight Trash Signature model. "I always loved the aesthetics about the Casino. There's something about the white pickguard as well as the sound... I really fell in love with it." P-90s are key to the Casino's canny combination of chime and grit. The P-90 is a touch sensitive pickup by nature and is perfect for both lead and rhythm sounds. P-90s carry more "weight" sonically than the typical single coil pickup and have the effect of sounding especially "electric" when combined with the Casino body. Just listen to Beatle tracks like "Paperback Writer" and "She Said, She Said" to hear how nuanced a basic chord can sound when played on a Casino. Gary Clark Jr. is probably today's most outspoken and visible Casino fan. Since signing to Warner Brothers, Clark has been seen with both a standard Casino, an Elitist, and a '61 50th anniversary model. And now, Clark has his own Ltd. Ed. 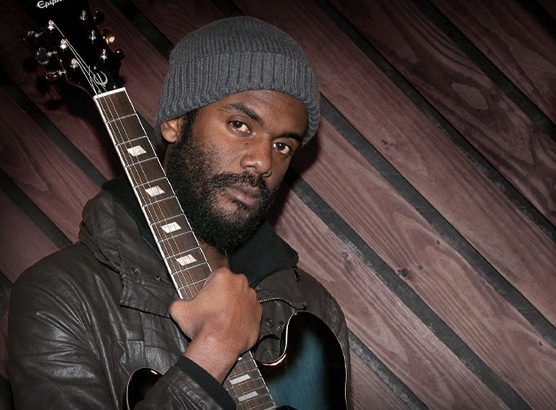 Gary Clark Jr. Blak & Blu Casino featuring Gibson USA P-90 pickups. "I had my eyeballs on Casinos for a while until I finally got one," Clark told Epiphone. They're all so amazing. 'Blak and Blu' with a Bigsby! They're a dream." Read our feature on the Blak & Blu and read our new interview with Clark here. Even if The Beatles had not discovered the Casino, the list of fans would still include virtually every major pop, country, blues, and rock artist of the last 50 years. "It's really a perfect electric guitar," said Jim Rosenberg, "it can be clean, it can be knarly and it sounds terrific at low volume and feeding back. And it's a lot like Epiphone, too. A bit of a maverick."